These words, written by the late Barbara Harper – Nelson, perfectly explain the reasoning behind this remarkable book, “The French Squadrons“. The dedication needed to not only document her daily life in 1944, but to retain the love letters of her French airman boyfriend, Francis Usai, across many subsequent decades, while moving half way around the world, is what makes this book unique. Barbara was once the nineteen year old girlfriend of a twenty-two year old French airman, Francis Usai, who served in RAF Bomber Command at RAF Elvington. Remarkably, she kept all the letters she received from the young Frenchman, exiled from his home country but still fighting for freedom. The French Squadrons by Barbara Harper-Nelson & Geneviève Monneris is the result of Barbara’s diaries combined with Francis’ letters, which provides a remarkably accurate daily social record of what was, as Barbara wrote, “the birth of a different world”. Ian Reed explains the story further, ” “346 Guyenne” and “347 Tunisie” were the only two French heavy bomber squadrons of World War II, who fought with RAF Bomber Command from mid 1944 until the end of hostilities. The 2300 young French airmen were uniquely based at RAF Elvington near York, now the home of the The Allied Air Forces Memorial & Yorkshire Air Museum”. This story of Barbara’s diaries and Francis’ letters might never have been told, had it not been for a chance discovery in the Museum archives. “During 2009, Geneviève Monneris and I were searching for documents and photographs for a film she was making about French airman Sgt. Henry Martin (based at Elvington) and his young English wife who, unbeknown to him, was a special agent in S.O.E. and who later worked for Winston Churchill and Gen. De Gaulle”. Francis’ original imaginative, funny and, at times, deeply sad and emotional letters were written under enormous stress during his time when he was flying into Germany most nights and never knew if he or his friends would return. Barbara kindly donated them to the Museum in 2010 and they have subsequently been loaned to the French national archive, being the largest single social history collection of the period in France, who have acknowledged their importance as a significant educational and academic study resource. After many months of editing, translation and consultation with Barbara by Geneviève Monneris & Michel Darribaude (both children of French Elvington veterans) the story was initially published as ‘The Bright Squadrons’ in hardback and available from the Museum shop online. The paperback version is also available via Amazon here or direct from publishers Amberley Books here. The book has been reprinted in softback and renamed ‘The French Squadrons’ to more accurately reflect the content and the background to the story of the thousands of young French airmen exiled in Britain. Like the young Francis’, his thoughts with his family, then under NAZI occupation in Marseille. Alongside the English version, the French language version (Les Bombardiers Lourds Français de la RAF) has also just been published in France and Belgium. This is a book not only to be read from cover to cover. Just as anyone’s personal diaries tell a story, it is also equally interesting to open and pick moments in any relationship such as this and explore the progression and to try to guess how it will turn out. Barbara lived in Western Australia until she passed away on 30th May, 2016. The final entries in the diary reflect the tumultuous international events of the time with people displaced around the world, vowing to keep in touch in ways that were not always possible during those uncertain days. International best selling author, Kate Atkinson, whose recent book “A God in Ruins” also deals with a WWII RAF Halifax bomber crew says “The French Squadrons is a vibrant glimpse into the past – history as it was actually lived, moment by moment“. The French Squadrons is a remarkable record of human nature and relationships in the changing times of the world, and we are fortunate that this highly entertaining story and documentary record remained intact for us to read once more, many decades later and to pay tribute to the French airmen of 346 “Guyenne” and 347 “Tunisie”, French Air Force, along with all those within Royal Air Force Bomber Command. Sgt Francis Usai – 2nd November 1944. The Yorkshire Air Museum receives no continuous financial aid from local or national government. There are a number of ways you can support the Museum. Below are a number of exclusive items that are available online through our Shop. 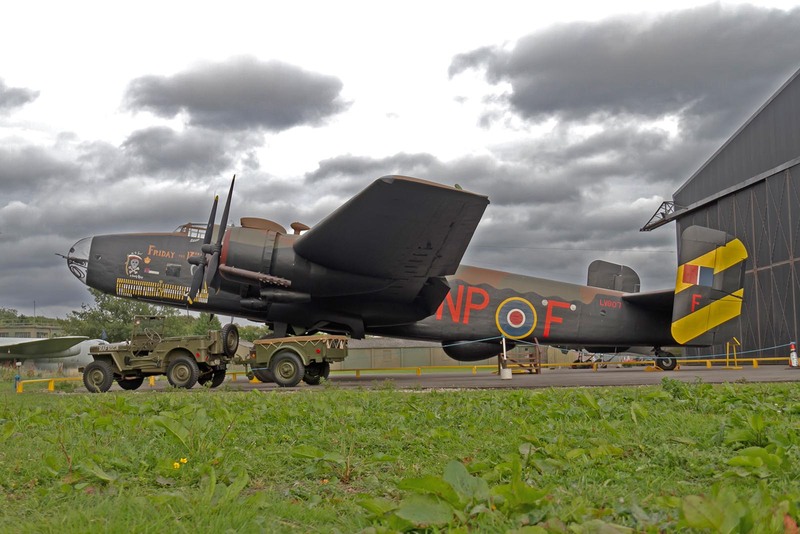 From publications and books to aircraft sponsorship, your help is greatly appreciated in ensuring the continued efforts of The Allied Air Forces Memorial and The Yorkshire Air Museum. The Halifax Sponsorship includes a one hour personal tour of the aircraft interior and cockpit with a museum aircraft specialist and souvenir photographs of the event. The Wing Sponsorship is available for certain aircraft of the Museum where the cabin and/or cockpit can be made accessible. This sponsorship includes an admission gift pass for one, valid for twelve months and allowing unlimited visits, plus a gift pack and certificate, with the added exclusive benefits of a one hour personal appointed tour of the cabin and/or cockpit with one of our museum aircraft specialists and souvenir photographs of the event.